Tabla player Shen Flindell's personal blog, featuring news of his travels and experiences, plus other interesting snippets. 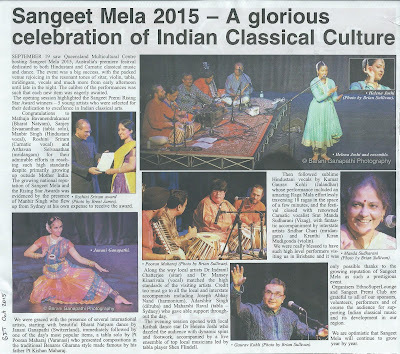 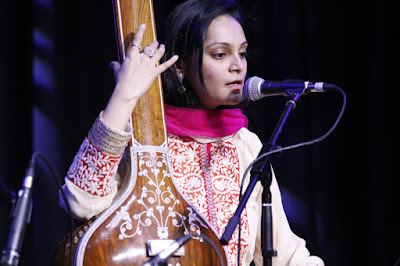 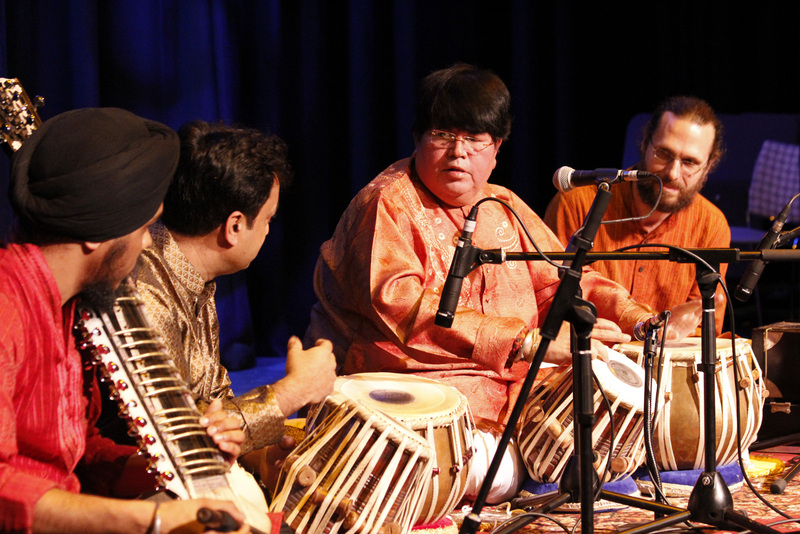 September 19 saw Queensland Multicultural Centre hosting Sangeet Mela 2015, Australia's premiere festival dedicated to both Hindustani and Carnatic classical music and dance. The event was a big success, with the packed venue rejoicing in the resonant tones of sitar, violin, tabla, mridingam, vocals and much more from early afternoon until late in the night. 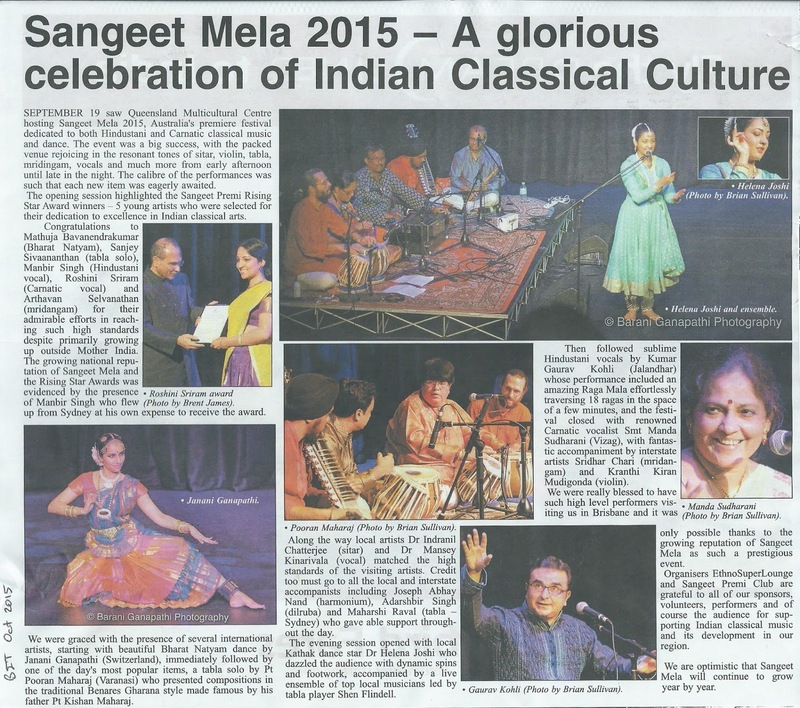 The calibre of the performances was such that each new item was eagerly awaited. 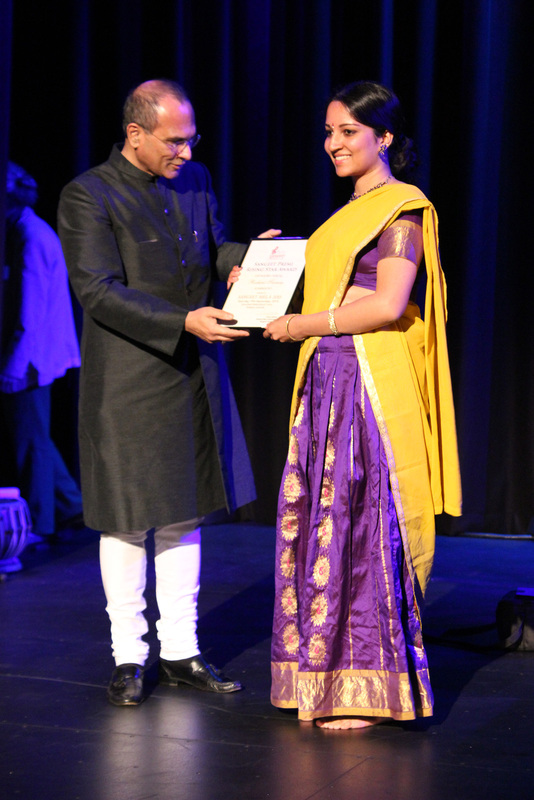 The opening session highlighted the Sangeet Premi Rising Star Award winners – 5 young artists who were selected for their dedication to excellence in Indian classical arts. 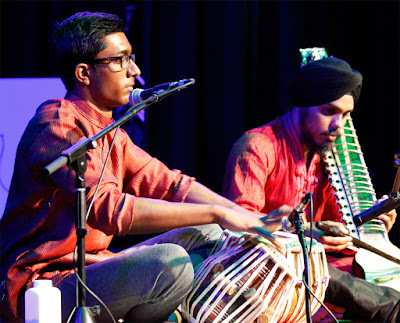 Congratulations to Mathuja Bavanendrakumar (Bharat Natyam), Sanjey Sivaananthan (tabla solo), Manbir Singh (Hindustani vocal), Roshini Sriram (Carnatic vocal) and Arthavan Selvanathan (mridangam) for their admirable efforts in reaching such high standards despite primarily growing up outside Mother India. 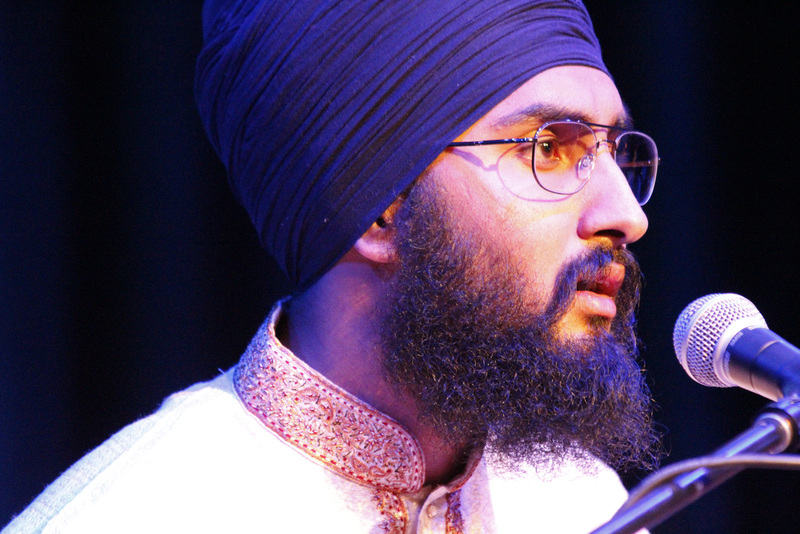 The growing national reputation of Sangeet Mela and the Rising Star Awards was evidenced by the presence of Manbir Singh who flew up from Sydney at his own expense to receive the award. Dr Indranil Chatterjee (sitar) with Sri Shen Flindell (tabla), enjoying completion of Raga Bhimpalassi in matta taal and teentaal. 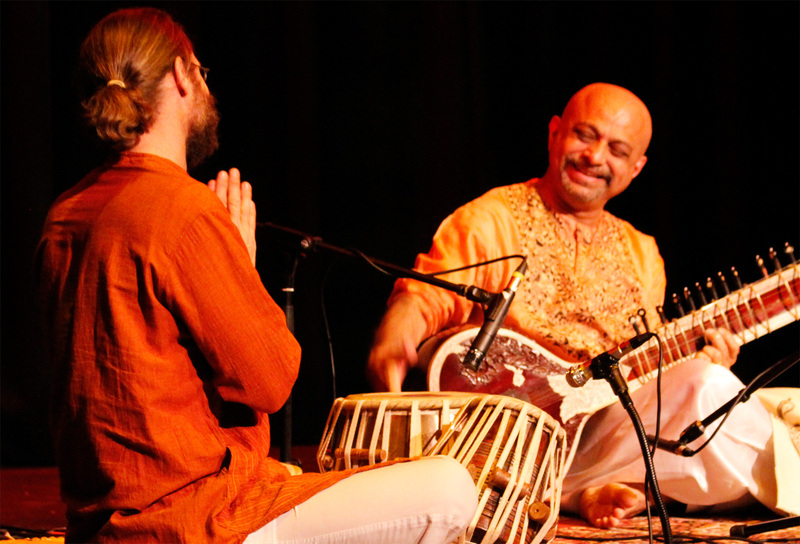 We were graced with the presence of several international artists, starting with beautiful Bharat Natyam dance by Janani Ganapathi (Switzerland), immediately followed by one of the day's most popular items, a tabla solo by Pt Pooran Maharaj (Varanasi) who presented compositions in the traditional Benares Gharana style made famous by his father Pt Kishan Maharaj. 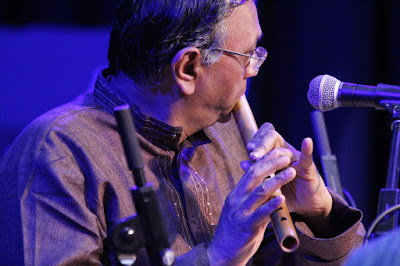 Along the way local artists Dr Indranil Chatterjee (sitar) and Dr Mansey Kinarivala (vocal) matched the high standards of the visiting artists. 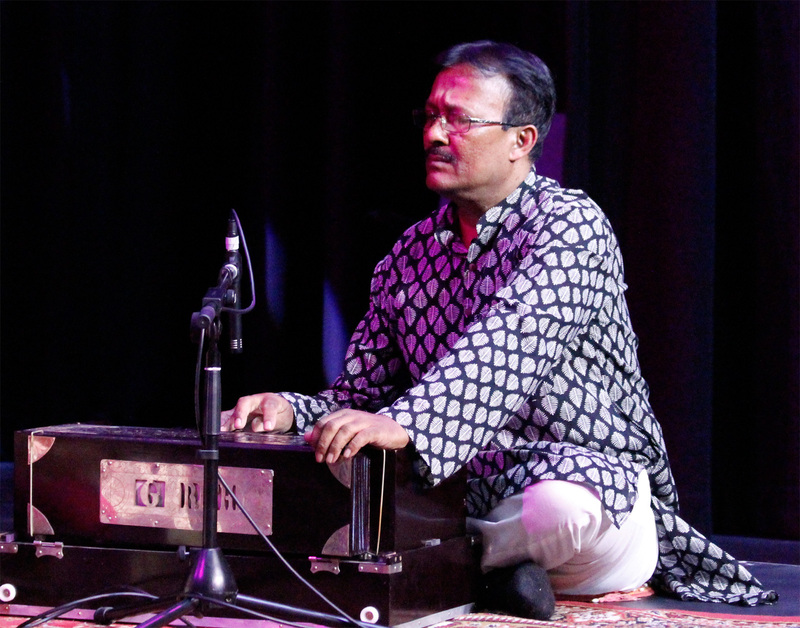 Credit too must go to all the local and interstate accompanists including Joseph Abhay Nand (harmonium), Adarshbir Singh (dilruba) and Maharshi Raval (tabla – Sydney) who gave able support throughout the day. Tabla solo by Pt Pooran Maharaj (Varanasi) - accompaniment by Sri Joseph Nand (harmonium, off-photo) and Sri Adarshbir Singh (dilruba), taali support by Sri Maharshi Raval and Sri Shen Flindell. 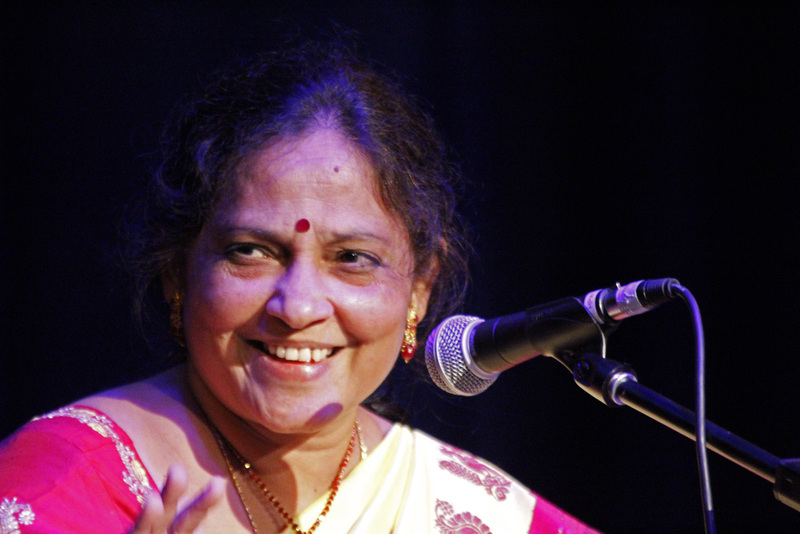 Hindustani vocal recital by Dr Mansey Kinarivala. 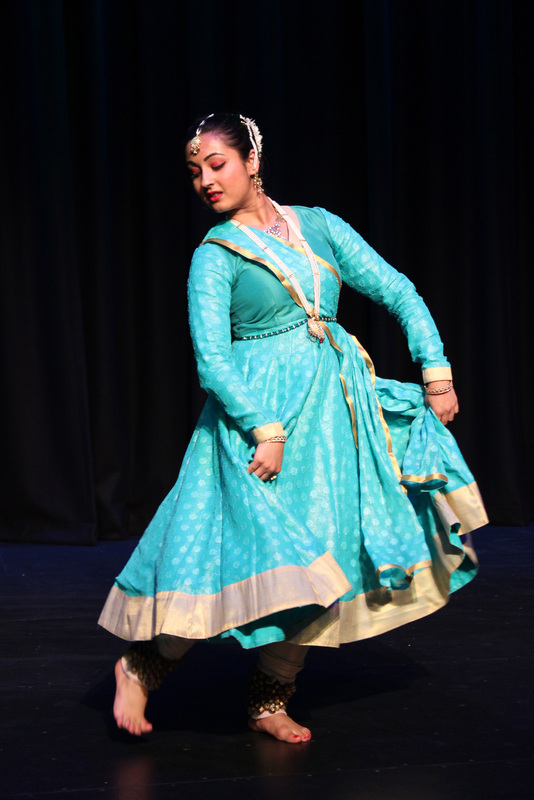 The evening session opened with local Kathak dance star Dr Helena Joshi who dazzled the audience with dynamic spins and footwork, accompanied by a live ensemble of top local musicians led by tabla player Shen Flindell. Then followed sublime Hindustani vocals by Kumar Gaurav Kohli (Jalandhar) whose performance included an amazing Raga Mala effortlessly traversing 18 ragas in the space of a few minutes, and the festival closed with renowned Carnatic vocalist Smt Manda Sudharani (Vizag), with fantastic accompaniment by interstate artists Sridhar Chari (mridangam) and Kranthi Kiran Mudigonda (violin). 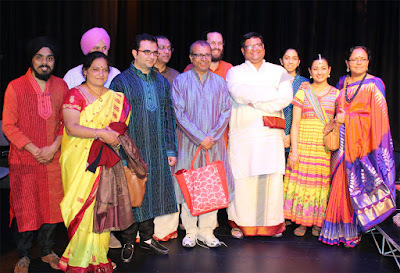 We were really blessed to have such high level performers visiting us in Brisbane and it was only possible thanks to the growing reputation of Sangeet Mela as such a prestigious event. 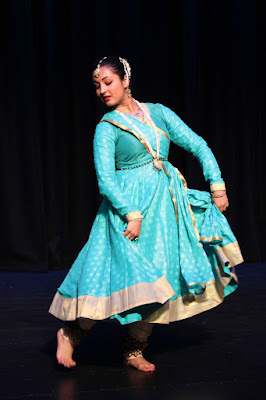 Kathak dance by Dr Helena Joshi and live ensemble: Sri Shen Flindell (tabla), Smt Usha Chivukula (vocal), Sri Joseph Nand (harmonium), Sri Adarshbir Singh (dilruba), Sri Murali Ramakrishnan (bansuri). 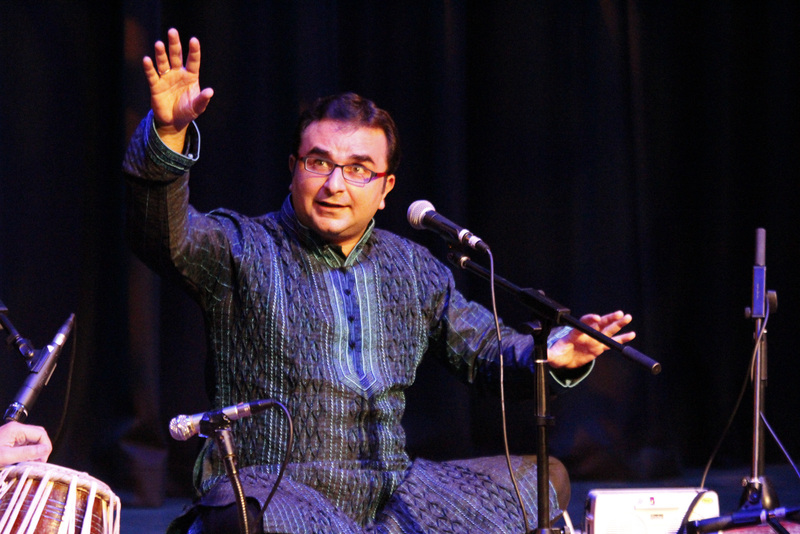 Kumar Gaurav Kohli (Hindustani vocal) gave a memorable performance. 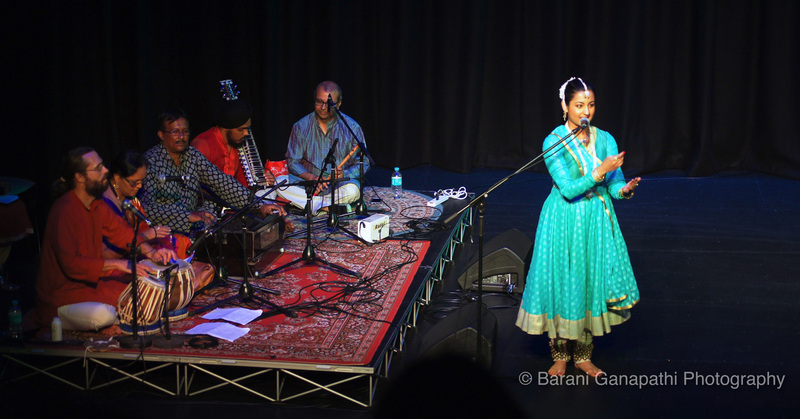 Organisers EthnoSuperLounge and Sangeet Premi Club are grateful to all of our sponsors, volunteers, performers and of course the audience for supporting Indian classical music and its development in our region. 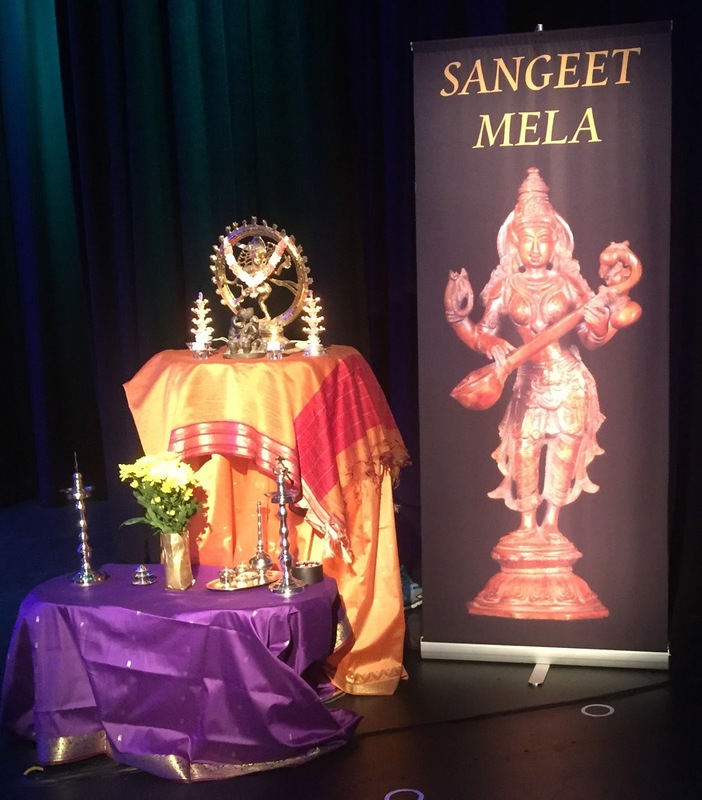 We are optimistic that Sangeet Mela will continue to grow year by year and make Brisbane a focal point for Indian classical arts nationally. Cast photo of those performers who could be there at the end! 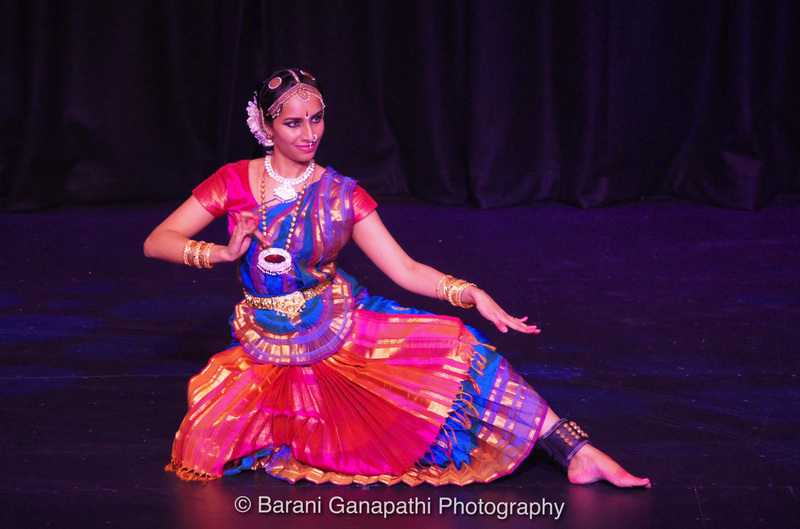 See the full set of official photos in our Facebook album.